KATHMANDU: If you are scared of forests, you might miss the diversity it boasts, that is what the Food Agriculture Organization’s video on the World Forest Day shows. “The forests can seem scary,” the video starts with a little girl wandering in the night, all by herself. Then a butterfly flies past her and things change. “Look closer…you will see the beauty…see the wonder…discover the many treasures they hold…the life they sustain,” the video shows. Forests cover about four billion hectares (16 million square miles). That represents about 30 percent of Earth’s land surface or eight percent of its total surface area. Ten countries hold about two-thirds the world’s forest cover, led by Russia (7.8 million square kilometers), Brazil (4.8m sq km), Canada (3.1m sq km), the United States (3m sq km), China (1.8m sq km) and Democratic Republic of the Congo (1.8m sq km). In Nepal, forests cover 44.74 percent of the country’s total area, according to the Ministry of Forest and Environment. These forests not just provide habitat for wildlife, it also to safeguard livelihood means. The conservation of forests is also crucial to achieving the 17 Sustainable Development Goals. 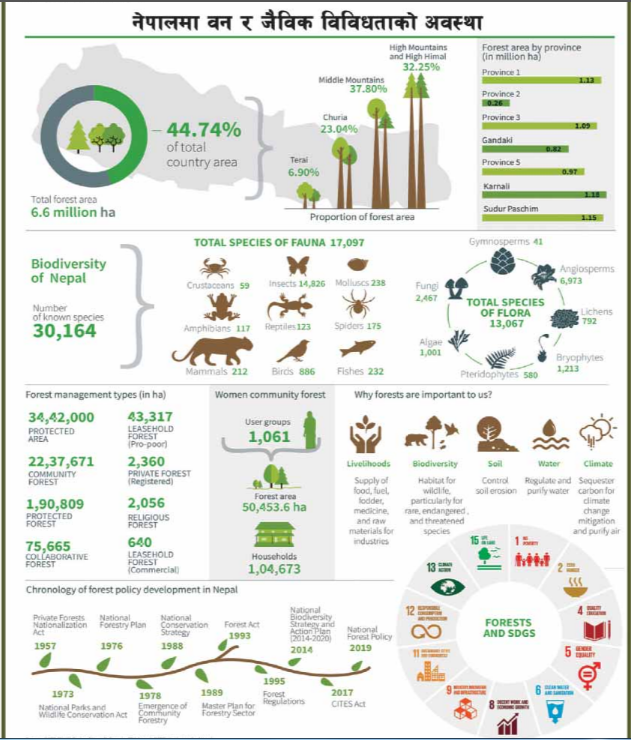 The 6.6 million ha of forests in Nepal is home to at least 30,164 known species. They are also home to 17,097 species of fauna and 13,067 flora. At least 1,04,673 households rely on forests for livelihood means. There are 1,061 women community user groups. The middle mountains have the highest forest concentration – 37.8%. This is followed by High Mountains and High Himals (32.25%), Chure (23.04%) and Terai (6.9%). Karnali Province has the highest forest area at 1.18 million ha. The lowest is in Province 2 – 0.26 million ha. Every minute we lose 60 Football fields worth of forests to deforestation that’s one football field lost every second. 150 species a day become extinct because of habitat loss. Cutting down trees releases the same amount of annual carbon in the atmosphere as all cars, trucks, planes and the trains in the world combined. More than 80% of the earth’s natural forests have already been destroyed. The world is witnessing a net loss of 3.3 million hectares of forests area a year. Loss of forests contributes between 12 percent and 17 percent of annual global greenhouse gas emissions. If the current rate of deforestation continues, it will take less than 100 years to destroy all the rainforests on the earth. The total world forest loss to date is 7.3 million hectares per year. Up to 28,000 species are expected to become extinct by the next quarter of the century due to deforestation. 13 million hectares per year in South America and Africa and South East Asia is converted from forest to agriculture land. Half of the world’s tropical forests have already been cleared. Over 4 million tons of junk is created online by spamming.